The cruise log is over (thank GOD, I hear you say) and I'm deep in the land of Dubai tales. 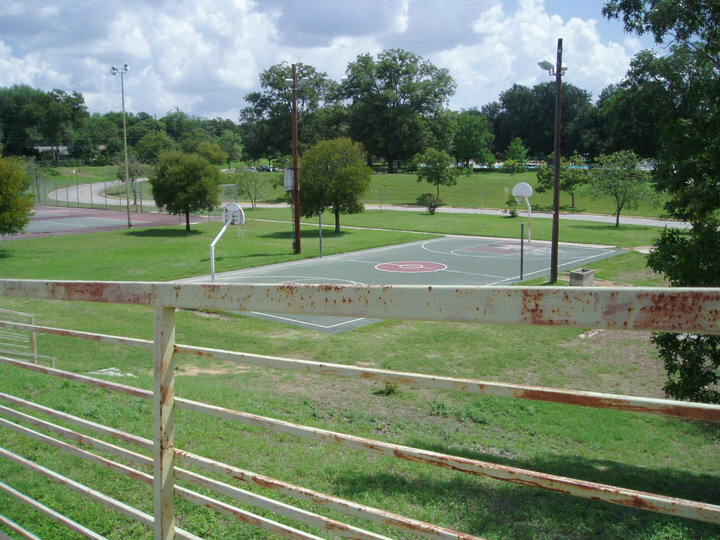 Before I get swallowed up, here's an ex-pat POV of an Austin, Texas treasure. 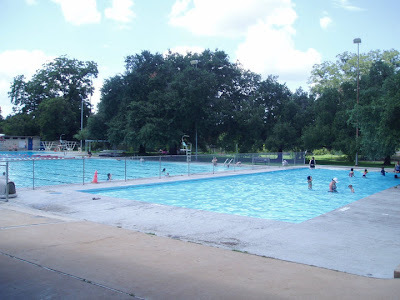 Austin's earnest Parks & Recreation Department offers many super swimming holes including the world renowned Barton Springs and Deep Eddy Pool but my own local, Beverly S. Sheffield Park, aka Northwest pool, is surely the prettiest in town. I've been going there for years and swimming regularly for the last three. I used to take my stepsons but now it's usually just me. I was on the doorstep when the pool opened on April 23. It was sunny but the water was cold; I was exhausted and shivering after only 6 lengths. Still, I was there. Now it's May 29 and in the mid 90s. The water has warmed up and every visit's a treat. After performing Creepy Campfire Stories for crazy end-of-semester elementary kids all morning and invoicing all afternoon, I grab my swim bag and make the 1-mile drive to the park. Leaving my car in a shady residential street, I walk over the wooden bridge, across the basketball court, alongside the tennis courts, up the hill and along the path to the main entrance. Schools break for summer tomorrow so while the pool is busy today, it's nothing compared to the watery Bedlam I can expect this weekend. As the sun slips slowly westward, I see the regulars who do what I do: swim for exercise while at the same time enjoying the perfection of the park. Along with the swimmers, there's Tall Round Man who walks from one side to the other; never seen him swim. There's Grumpy Old Lady who sets up her floating bed so it's half poolside, half in the water. She never swims either and gets thoroughly bad-tempered if the water rocks her bed, mumbling to herself and scowling at children who come near her. All last summer, Tall Round Man and I commented lightly as we passed each other, him walking, me swimming: "I see she's no happier today!" and "She's particularly miserable this afternoon!" All last summer, she scowled at me when I swam nearby, even when it was just to touch the side before swimming another length. Today, I take a breath and say, "Hello, how are you?" and the next thing, I'm having a full-on conversation about England and how much she loves it. I've broken the ice! And I may, like it or not, be chatting with her daily for the next 5 months! "But it could be worse," I think. "I could be at the Lido Swimming Pool in Winchester." In Austin, it's pool weather from May until October. Not so in England. The Lido opened annually on 1st May regardless of the weather and when I remind you that it occasionally snows in England in May, you'll understand my appreciation of central Texas' climate. When I was ten, a Hampshire Chronicle photographer came to my school, St. Peter's Roman Catholic Primary, to find kids who wanted to be first in the pool on 1st May. Since I was an appalling swimmer (could barely swim at all), it seems unlikely I'd respond, and yet I apparently volunteered. More likely, I was volunteered. Along with a boy from my school, Keith Tasker, I went to be "first in the pool." There were three other kids from other schools. It was a freezing, blustery, grey day and none of us wanted to get in, let alone swim. There was no question of us not getting in; nevertheless we hung back. If I recall correctly, the water temperature was 50 deg. F. The photographer eventually shoved me bodily into the icy water. I screamed as if I'd been stabbed. Mum kept the black and white photo for years; I wish I still had it to show you. The caption read: "Five Brave Young Swimmers Battle the Water at the Winchester Lido on 1st May" and shows the five of us huddled together like penguins in an Antarctic storm. I'm wearing a regulation black swimsuit and a white rubber cap. I was utterly miserable, and I look it. I smile at Grumpy Old Lady. "See you tomorrow," I say as I head into the sunset. I know when I'm blessed. The pool was behind the wall. It's a parking lot now. Germany has long been into the swimhall thing, indoor pools and open all year long. Costs a bit, though. A commercial for British Air summoned up my experience with English beaches. Long shot of empty pier stretching into choppy, gray water reflecting gray cloudy sky. Sound of a few gulls and waves. Camera rotates to beach along long, empty and gray. Slow zoom to two lonely rock-like lumps. Soundtrack still waves and gulls. Slow zoom to lumps. Suddenly "Ethel, look, the sun." Towels and coats thrown to the sand reveal not rocks but a man & woman in bathing suits, heads face up, arms outstretched. "ahh, that's done." The two climb back into chairs silently covering themselves again with coats & towels. Logo slides onto screen, voiceover suggests taking a plane elsewhere for holiday.